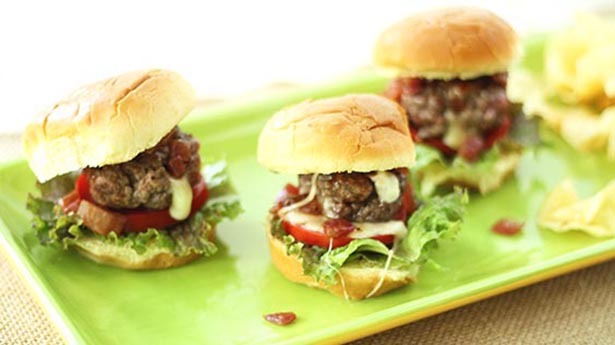 These delightful bite-sized burgers really make a statement when filled with gooey cheese and topped with a tangy onion jam. Perfect for entertaining! Over medium heat, melt butter in a medium sized heavy-bottom pot. Add diced onions and season with a pinch of salt and pepper. Cook until translucent and slightly caramelized, about 8-10 minutes. Add in balsamic vinegar and turn heat down to low. Cook another 5 minutes, until liquid is reduced by half and mixture thickens. Remove from heat and let cool. In a medium-sized mixing bowl, combine ground beef and seasonings until thoroughly combined. Roll into 12 balls, approximately 3 inches in size, place on a baking sheet and set aside. Cut cheese into 12 cubes and then cut each of those into 2 smaller cubes. Make a well in each of the burgers and place two pieces of cheese inside, and then mold the burger around cheese securing it inside. Gently press down to flatten into burger patty. Cook over medium heat on grill or in grill pan, flipping once. Don’t over-cook or cheese will melt out of them. Remove from heat and let rest about 3-5 minutes. Prepare the buns by placing one slice of tomato and one piece of lettuce on the bottom bun, followed by the burger and then topped with approximately 1 heaping tablespoon of the onion jam, cover with top of bun and serve.